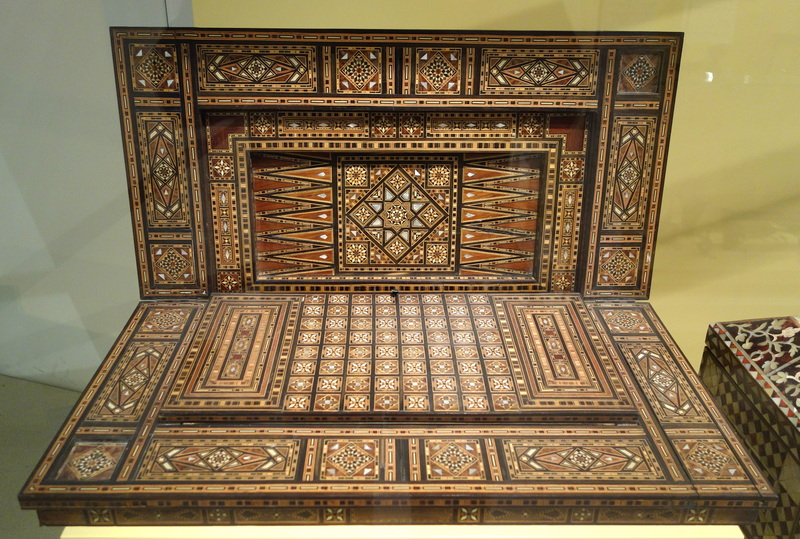 Nard (نرد‎), originally called Nardashir (نردشیر‬), is a Persian game, which is played on a backgammon board. 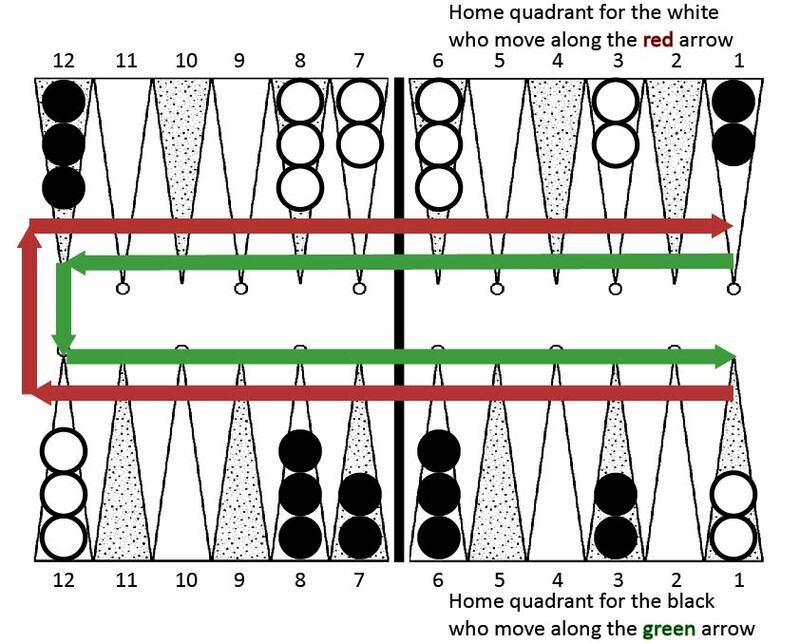 The modern backgammon and its variations originated with the Persian Nard. The earliest source to mention the game, Nardashir, by name, is the Babylonian Talmud (Ketubot 61b), in an anonymous statement, which is dated to the latest stratum of the Talmud, 500-600 CE. ואלו מלאכות שהאשה עושה לבעלה … ארבע יושבת בקתדרא … רשב”ג אומר אף המדיר את אשתו מלעשות מלאכה יוציא ויתן כתובה שהבטלה מביאה לידי שיעמום. היינו תנא קמא? איכא בינייהו דמיטללא בגורייתא קיטנייתא ונרדשיר. 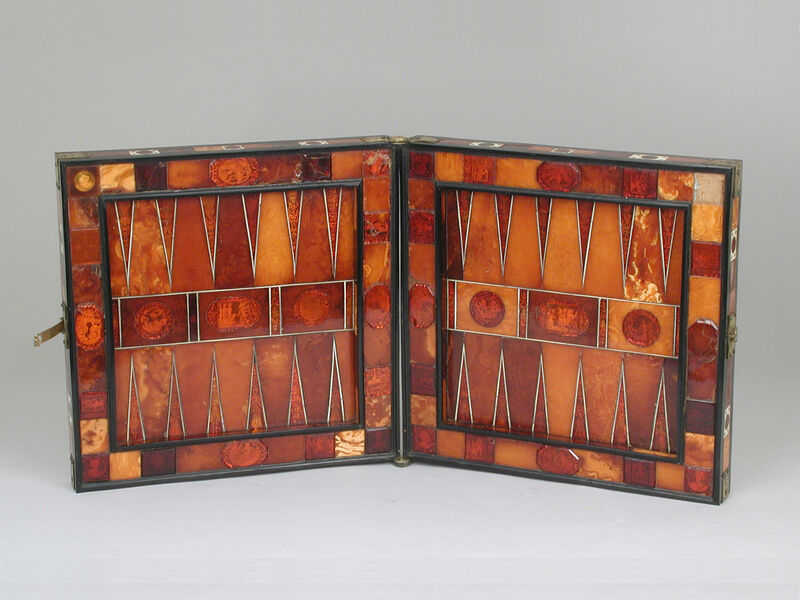 German backgammon board from the 17th century, made from amber, ivory, brass, and ebony. Metropolitan Museum of Art, 48.174.41. However, the Talmud does not explain how to play the game. According to some historians, such as Murray, the game Nardashir was possibly invented by the 3rd century Sassanian king Ardashir I. However, as I will point out from the sources it is clear that that is not true. 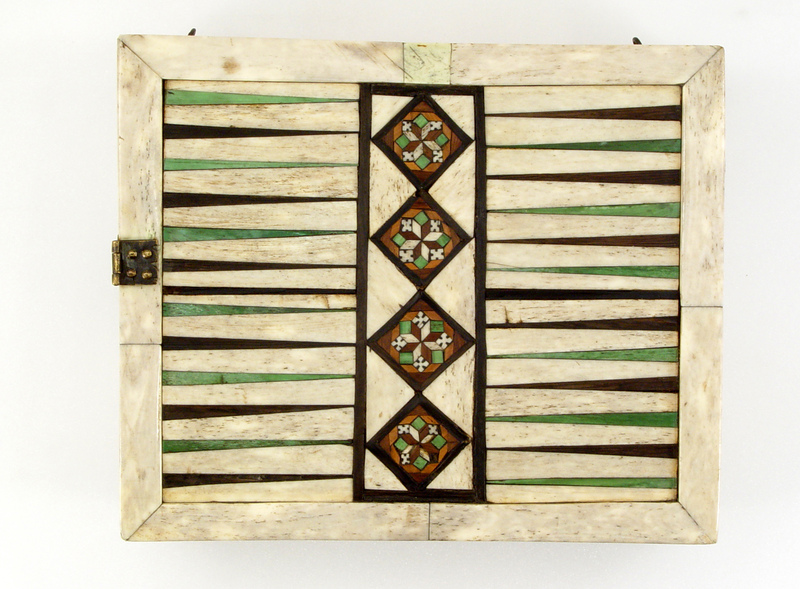 Middle Eastern Backgammon and chess board, made from wood, wood veneers, bone, and mother of pearl inlay. Late 19th century. Royal Ontario Museum, Toronto, Canada. Photo: Wikimedia Commons. In a 7th century CE, Pahlavi work, called Kar-Namag i Ardashir i Papakan (کارنامهٔ اردشیر بابکان), Book of the Deeds of Ardashir, Son of Papak, (1:30), we are told that the Sassanian King, Ardashir I (reigned 224-241 CE), excelled at playing this game, while he was still a favorite in the service of the Parthian King, Ardavan (Artabanus) V (reigned 208-224 CE), implying that the game was already in existence in the early 3rd century CE. When Ardavan saw Ardashir he was glad, expressed to him his affectionate regard, and ordered that he should every day accompany his sons and princes to the chase and the polo-round. Ardashir acted accordingly. By the help of Providence he became more victorious and warlike than them all, on the polo and the riding (ground), at Chatrang (Chaturanga chess) and Vine-Ardashir (Nardashir), and in (several) other arts. Sanjana, Darab Peshotan. The Karname i Artakhshir i Papakan: being the oldest surviving records of the Zoroastrian emperor Ardashir Babakan, the founder of the Sasanian dynasty in Iran; the original Pahlavi text edited for the first time with a transliteration in Roman characters, translation into the English and Gujerati languages, with explanatory and philological notes, an introduction, and appendices. Printed at the Education Society’s Steam Press, Byculla. 1896. Many historians imply that based on this quote Nardashir was already known in the 3rd century CE. However, it is clear that this quote, written in the 7th century CE, is merely an anachronism due to the confusion between the game being named after Ardashir I as a tribute to him, and him actually playing it, as is explained in the main story of the invention of chess (Chaturanga or Chatrang) and backgammon (Nardashir or Nard), quoted next. Embriachi bone and wood using the certosina technique backgammon board, 15th century. Workshop of Embriachi, Italy. British Museum, 2004,1216.1.a-ii. 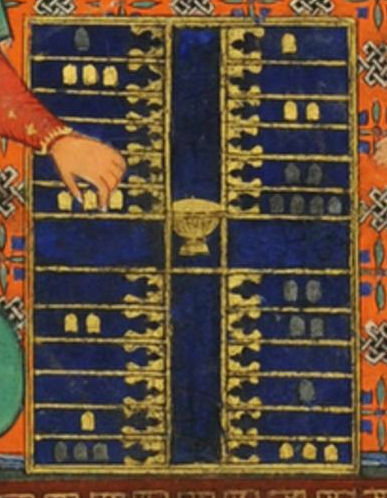 What seems to me is the more correct and realistic story of the invention of Nard, and therefore backgammon, is the story brought down in the 6th century CE Pahlavi work by the Persian Grand Vizier of the Sassanian emperor Khusro I, Bozorgmehr (Wuzurgmihr) (~498-590 CE), Wicarishen i Chatrang ud Nihishen i New-Ardashir, Treatise on Chess and the Invention of Backgammon, also known as Chatrang Nama. This book is short, consisting only of 39 verses, which I quote here in full, since it explains not only the history of both chess (Chatrang) and backgammon (Nardashir), but also the original rules on how to play them. It is said that during the reign of Khusro, of immortal soul, for the sake of testing the wisdom and knowledge of the Iranians and to see his own benefit, Debshalm, great sovereign of the Indians, sent one set of chess (Chatrang), 16 pieces made from emerald and 16 pieces made from red ruby. Along with that (game of) chess (Chatrang) he sent 1200 camel loads of gold and silver and jewels and pearls and goblets (and) 90 elephants and things specially made for them, which were sent along, and Taxtritos who was notable among the Indians was sent along. Since you are named king of kings, and over us you are king of kings, then your wise men also must be wiser than ours, either you explain the logic of this (game of) chess (Chatrang) or send (us) tribute and tax. The king of kings asked for 3 days, and there was not one among the wise-men in the Sassanian Empire who was able to explain the logic of that chess (Chatrang game). May you be immortal, I did not explain the logic of this game of chess (Chatrang) till today for that reason so that you and anyone who is in the Sassanian Empire know that I am the wisest in the Sassanian Empire. I will easily explain the logic of this (game of) chess (Chatrang) and will take tribute and tax from Debshalm, and I will create and send something to Debshalm which he will not be able to explain, (and) for the second time I will again take tribute and therefore it will become certain that you are worthy of the kingship and our wisemen are wiser than those of Debshalm. The king of kings said 3 times thus, “Bravo Wuzurgmihr, our Taxtritos,” and he commanded to give Wuzurgmihr 12,000 silver coins. Debshalm has designed this chess (Chatrang game) like a battle in purpose. He made the king like the two overlords at the center, the rook (on) the left and right flank, the Vazir like the Commander of the Warriors, the elephant is like the Commander of the Bodyguards, and the horse is like the Commander of the Cavalry, the foot-soldier like the same pawn, that is at front of the battle(field). May you be immortal, God has given you this miraculous power, and glory and strength, and victoriousness. You are the lord of Iran and non-Iran. Several of the Indian wise-men prepared this set of chess (pieces) with much effort, and toil brought it to this place, (and) no one was able to (give an) explanation. Your Wuzurgmihr due to his innate wisdom rather so easily and simply explained it. Among the rulers of this millennium, Ardashir was more capable and most wise and I will name this (game) backgammon (New-Ardashir – Nardashir) in Ardashir’s name. I will make the board of the backgammon (Nardashir) like the Spandarmad (earth goddess, one of six manifestations of Ahura Mazda) earth. And I will make 30 pieces like the 30 night and day, I will make 15 white, like the day, and I will make 15 black, like the night. I will make one single die as the turning of the constellations and the revolution of the firmament. I will make the one on the dice like Ohrmzad (main Zoroastrian deity), who is one and all goodness was created by him. I will make the two like the spiritual and the material world. I will make the three like good thoughts, good words, and good deeds, and thoughts, words, and deeds. I will make the four like the four elements which the people are made of, and (like) the four corners of the world, northeast and southwest, and southeast, and northwest. I will make the five like the five lights, like the sun, and the moon, and the stars, and the fire and the heavenly brightness which descends from the sky. I will make the six like the creation of the creatures during the six periods of Gahanbars (Zoroastrian holiday). I will make the arrangements of the (game of) backgammon (Nardashir) on the board like the Lord Ohrmazd, when He created the creatures of the material world. The turning and revolution of the pieces by the die is like people in the material world, their bond connected to the spiritual world, through the 7 and 12 (planets and constellations) they all have their being and move on, and when it is as if they hit one against another and collect, it is like people in the material world, one hits another (person). And when by the turning of this die all are collected, it is in the likeness of the people who all passed out from the material world (died), and when they set them up again, it is in the likeness of the people who during the (time of) resurrection, all will come to life again. When the king of kings heard that speech, he became joyful and commanded 12,000 Arabian horses of the same hair (color), bridled with gold and pearls and 12,000 young men who are distinguished in the Sassanian Empire, 12,000 coat of mail armor of sevenfold and 12,000 swords prepared of Indian steel, (and) 12,000 seven-jeweled belts and whatever is needed for 12,000 men (and) horses, everything adorned in the most splendid manner. Wuzurgmihr, the son of Boxtag was made commander over them, and at the chosen date, with good fortune and with the aid of the Gods, sent to the Indians. Debshalm the great, the sovereign of the king of the Indians, when he saw them in that manner, he asked Wuzurgmihr, the son of Boxtag for 40 days time. There was no one among the wise-men of the Indians who knew the logic of that (game of) backgammon (Nardashir). Wuzurgmihr again collected as much tribute and tax from Debshalm and through good fortune and great splendor returned to the Sassanian Empire. The explanation (of) the logic of chess is this: Victory through skill, in the manner which the wise have said: The victor who wins through wisdom, from having the essential knowledge of weaponless war. The explanation of chess is this that, observation and striving through protecting one’s own piece, greater striving to be able to capture the other person’s pieces, not playing a bad hand because of hope of being able to capture the other person’s pieces, always keeping one piece on the attack and the others on the defense, observing with complete mindfulness, and other as has been written in the Book of Manners. Completed with salutation and joy. Daryaee, Touraj. On the Explanation of Chess and Backgammon. Abar Wīzārišn ī Čatrang ud Nihišn Nēw-Ardaxšīr. Afshar Publishing, 2010. 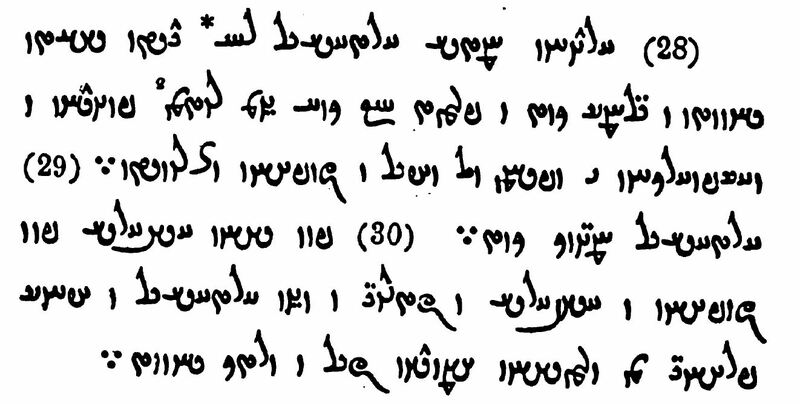 Jamasp-Asana, The Pahlavi Texts Contained in the Codex MK copied in 1322 A.C. by the Scribe Mehr-Âwân Kaí-khûsrû, Fort Printing Press, Bombay, 1913. This story, written by Bozorgmehr himself, about how he invented Nard, also fits in great with the quote from the Talmud, being dated to the 6th century CE, because the Talmud used this brand new game at the time, as an example that was familiar to everyone, and probably the talk of the town, to illustrate a question regarding civil law. Analysis by Murray and Kess (see bibliography) who question the authenticity of this story is simply not adequate due to their lack of expertise in reading and dating the original Jewish Aramaic and Pahlavi texts and using poor translations. A later retelling of the same story about Bozorgmehr’s invention of the game, is recorded in the Persian epic poem, Shahnameh (شاهنامه), The Book of Kings, by the Persian poet Hakim Abul Qasim Ferdowsi Tusi (حکیم ابوالقاسم فردوسی توسی), written in 1010. Ferdowsi has somewhat different rules than Bozorgmehr, and seems to be describing a completely different game, which has 8 pawns and a king on an 8×8 board just like chess. This resembles a modified Roman game Ludus Latrunculorum with two dice, which I will discuss separately. 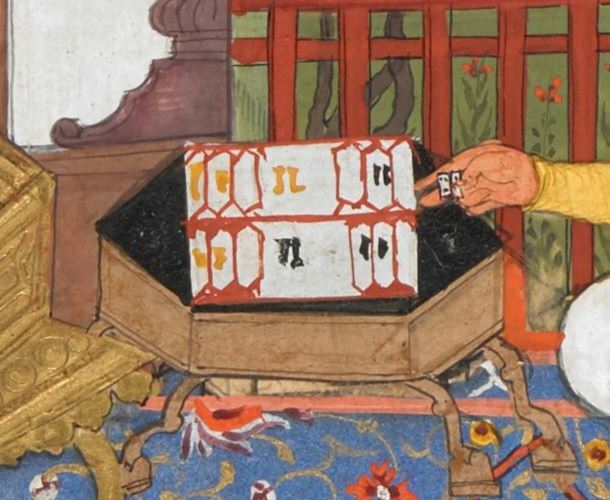 However, in the illuminated manuscripts of the Shahnameh, the game drawn is always the classic Nard/Backgammon, just with a different initial setup than what we are used to. How the illustrators interpreted Firdowsi’s words and compared them to their drawings is not really well understood. It is clear that Firdowsi’s audience knew exactly what the game was, and probably assumed that he took a poetic license to describe it, thus making his description historically not accurate. 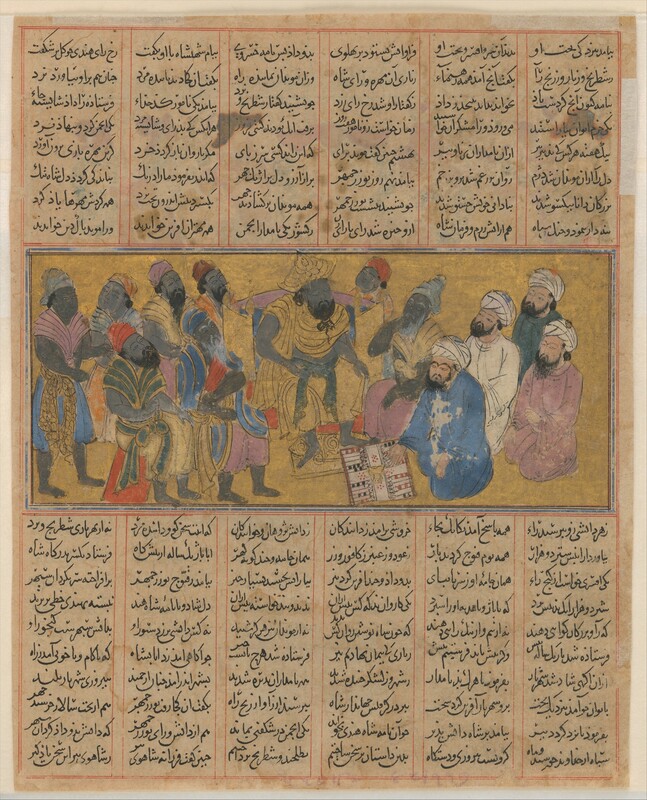 I have left out Firdowsi’s description of Nard out of this article on purpose, to avoid confusion, and only have shown the drawings from some of Shahnameh manuscripts, which clearly show Bozorgmehr’s original game. 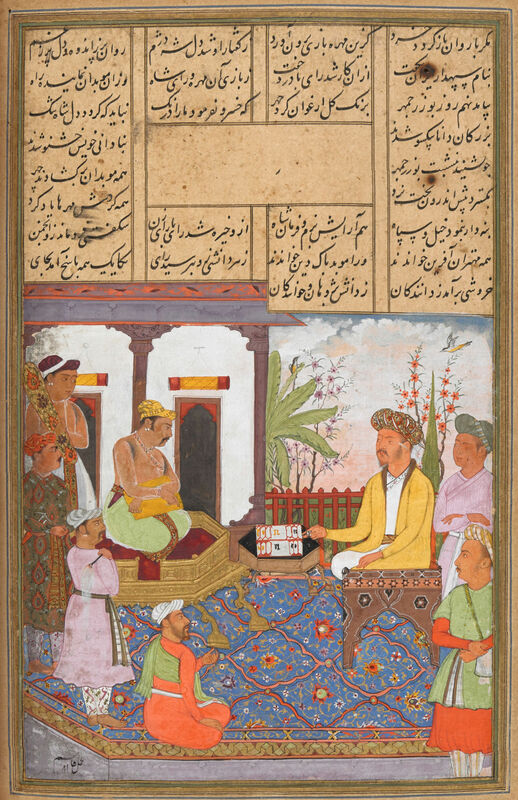 Bozorgmehr Explains the Game of Backgammon (Nard) to the Raja of Hind – Folio from a Shahnama (Book of Kings) manuscript circa 1300-1330 – Metropolitan Museum of Art, 34.24.2. I have recreated Bozorgmehr’s original rules, based on his explicit statements quoted above, his references to various aspects of Zoroastrian creation story, as written in the Zoroastrian book of creation, Bundahishn, and some historical depictions in illuminated manuscripts. Below I have summarized my inferences from his references to Zoroastrian creation story. 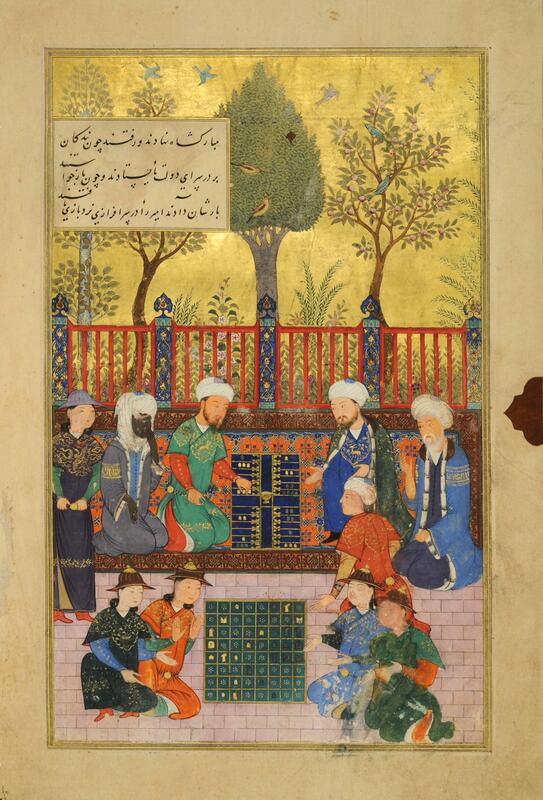 Chess versus Backgammon, illustrated folio from an Anthology of Persian Treatises, Afghanistan, Herat, Timurid period, 1427. Villa I Tatti, The Harvard University Center for Italian Renaissance Studies, Florence. 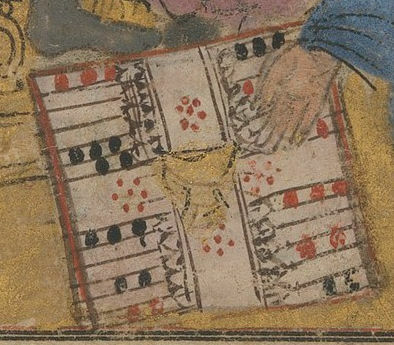 Drawing from a 15th century Shahnameh Illuminated Manuscript showing Bozorgmehr explaining how to play Nard with 2 dice in his hand, and a rather schematic backgammon board. British Library, Manuscript Add MS 5600, folio f.483v. The board is divided into 4 quadrants, because there are 4 elements from which everything was created. Each quadrant is divided into 6 lines, because first Ahura Mazda created 6 spirits (manifestations), or goddesses. 2 separate dice are used, one to represent revolution of the firmament and one to represent the revolution of the constellations. Closeup of the drawing from the above mentioned manuscript showing Bozorgmehr explaining how to play Nard with 2 (and not 1) dice in his hand, and a rather schematic backgammon board. The checkers move in opposite direction from each other, since the white ones represent Ahura Mazda, the good god, who is opposed by Ahriman, the evil god, in all of his doings, represented by the black checkers. Spandarmad is Ahura Mazda’s manifestation #3, out of the total 6. Therefore 3 checkers are placed on line 6 (representing 6 creations including man), on line 8 (??? ), on line 12 (representing 12 constellations). 2 checkers, representing the primeval man and primeval bull, are placed on lines 1, 3, and 7 (representing 7 planets). Closeup of the view of the setup of the Nard board from the two folios. Note the initial position of the checkers. Single checkers can be hit and removed off the board back to center bar to be re-entered into the game from the beginning. The game is for two players. The game equipment consists of a board with 4 quadrants with 6 lines in each; 30 round checkers, 15 white ones for one player, and 15 black ones for the opponent; and two 6 sided cubic dice with numbers 1-6 on it. The initial position of the checkers for each player is on lines 1 with 2 pieces, and line 12 with 3 pieces, one one side, and lines 3 and 7, with 2 pieces, and lines 6 and 8 with 3 pieces, on the other side. The pieces move in the opposite direction of the opponent’s pieces around the board to the opposite 4th, home quadrant. To determine who which player goes first, each player throws one dice and whoever scores higher goes first. This throw does not count for the first move. To start moving, both dice are thrown together and the value on each dice is the number of lines each checker can move starting from line 1. There is no specific order in which the checkers have to move around the board. The player can move any of the checkers at any time. There is no limit to how many checkers of a player can be present on a single line. A checker can be moved only to an open line. If a line is occupied by 2 or more checkers of a player, the opponent is not allowed to land on it. The numbers on the two dice constitute separate moves. For example, if a player rolled 2 on one dice and 6 on the other dice, they may move one checker two spaces, and another checker 6 spaces. Or they can move the same checker 2 spaces onto an open line, and then move that same checker another 6 spaces onto an open line. The intermediate stop of the checker must not be occupied by two or more of the opponent’s checkers. Bozorgmehr’s rules do not discuss scoring doubles (same number on both dice), and therefore in this rule set there is no special double move. Moves are mandatory. If it is possible to make a move from both dice then the player must make both moves. If only one move is possible and the other is not then the player must make that one move. If neither moves are possible, then the player skips their turn. If a single checker is present on a line, then it can be hit by an opponent’s checker and removed off the board onto the center bar, back to the beginning of the game. If there are two or more checkers present on a line then they are safe and the opponent cannot land on that line. If the player has checkers sitting on the bar they must move them back into the game first, before moving any other pieces. The checker on the bar lands onto the line equal to the number of one of the dice rolls, as long as that line is unoccupied. The player may not move any other pieces, until all of the checkers on the bar have been reentered back into the game. The player must make a move on the counts of both dice. So if one dice was used to move a checker from the bar, then the second dice must be used for another checker on the board, or the same checker to move further down the line. The checkers can move off the board only after all 15 of them have arrived in the home quadrant first. Checkers can be hit onto the bar even inside the home quadrant. Sanjana, Darab Peshotan. The Karname i Artakhshir i Papakan: being the oldest surviving records of the Zoroastrian emperor Ardashir Babakan, the founder of the Sasanian dynasty in Iran; the original Pahlavi text edited for the first time with a transliteration in Roman characters, translation into the English and Gujerati languages, with explanatory and philological notes, an introduction, and appendices. Printed at the Education Society’s Steam Press, Byculla, 1896. Murray, Harold James Ruthven. A History of Chess. Clarendon Press, 1913. Murray, Harold James Ruthven. A History of Board-Games Other Than Chess. Clarendon Press, 1952. Keats, Victor. Chess in Jewish History and Hebrew Literature. Magnes Press, 1995. Tarapore, J. C. Vijârishn I Chatrang: Or The Explanation of Chatrang and Other Texts. Transliteration and Translations into English and Gujarati of the Original Pahlavi Texts with an Introduction by J.C. Tarapore. Bombay: The Trustees of the Parsee Punchayet Funds and Properties, 1932.